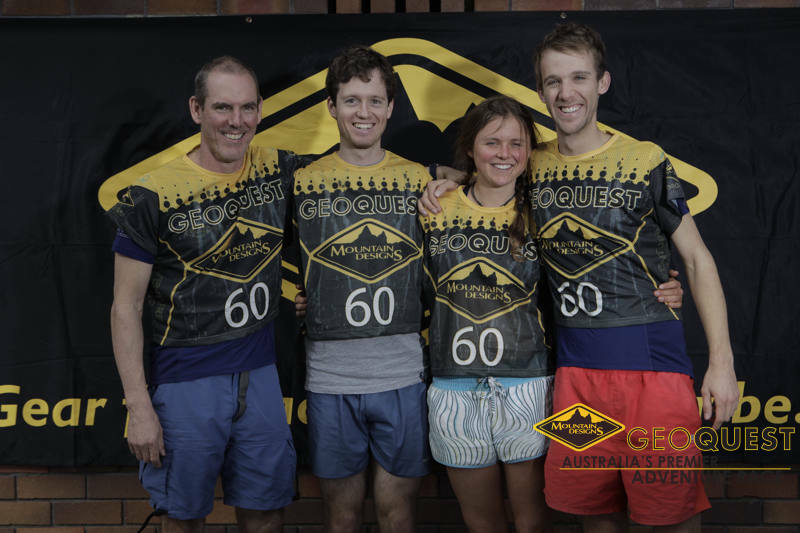 Since Wilson’s Prom I’ve been building towards the Mountain Designs Geoquest Half, a 24hr team adventure race with navigation, mountain biking, kayaking and running. 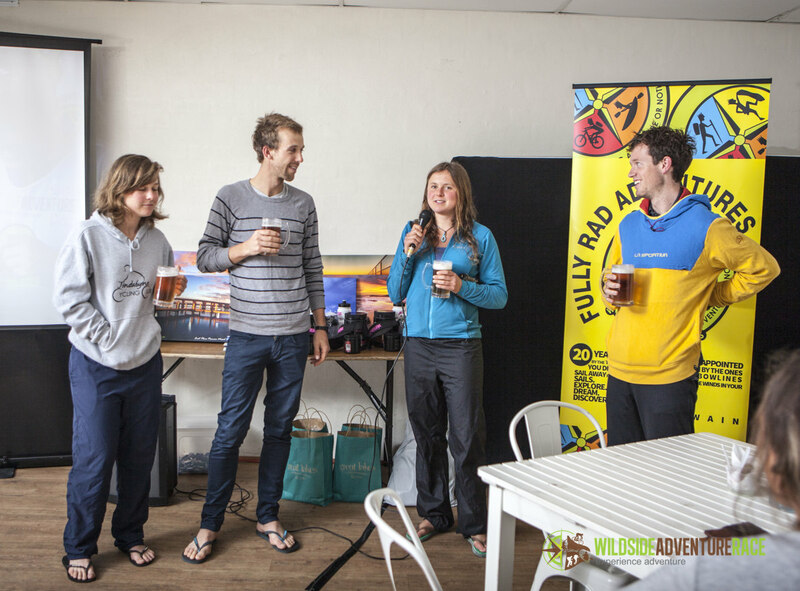 All male or all female teams are allowed to enter but the emphasis is on the premier (mixed) category. 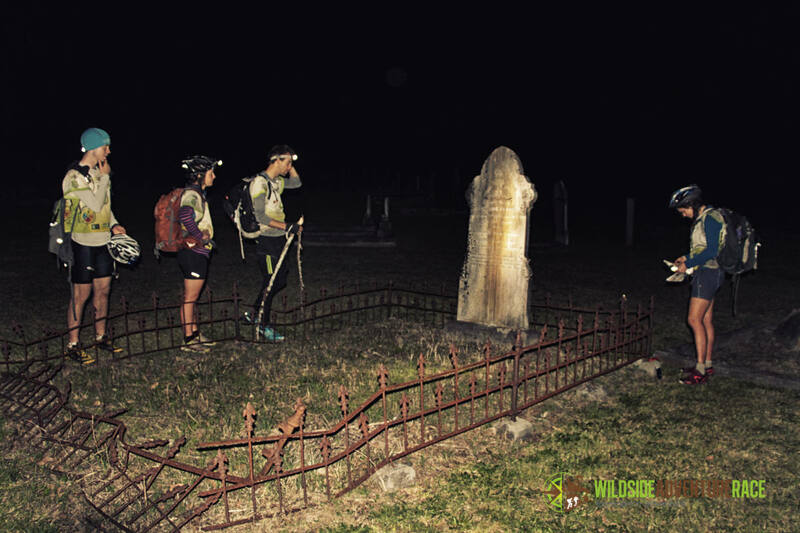 A few leadup events included winning the 6hr NSWRA Gibraltar Rocks rogaine with David Baldwin and practicing some night navigation with my teammate Oliver Johns at the ACTRA 5hr Kowen Forest night rogaine. This was Oli’s longest run to date, and here we were a bit scared to see Seb Dunne and co. training for the Geoquest Full (48hr version) by MTBing for a few hours out to Kowen, smashing the rogaine, then MTBing home! Keith Conley is an AR veteran but the rest of our team were newbies. 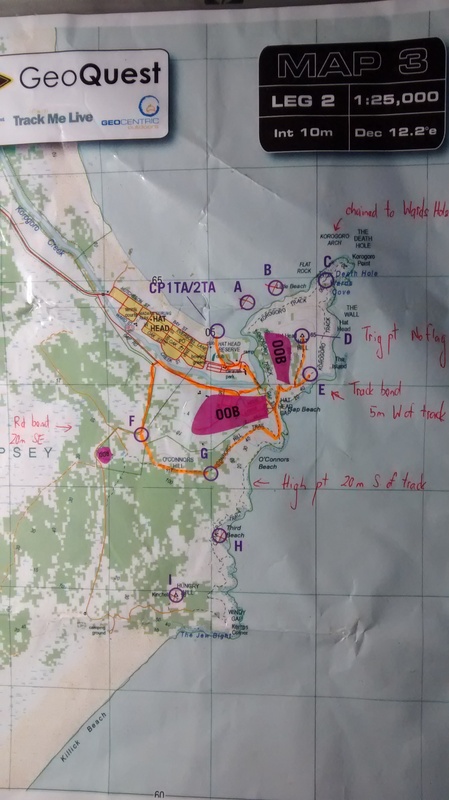 We had a pretty solid grounding in at least one discipline (Sarah – orienteering, Oli – MTB, me – trail running) but predicted we might struggle with kayaking and transitions. One of our strengths is navigation, with all 4 team members being individually competent. 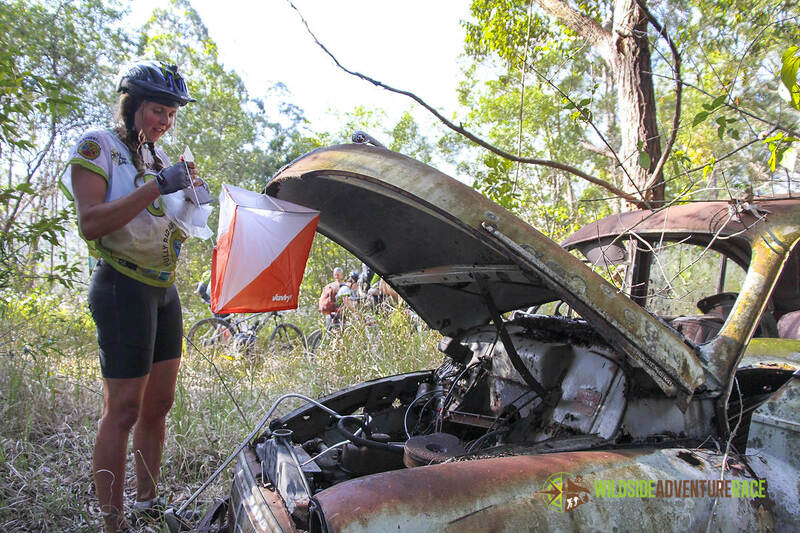 During the course release on Friday arvo, we almost wet ourselves with excitement at the prospect of the relay orienteering leg, predicting that we could make some big gains against other teams with only 1 or 2 navigators. Soon after that, I nearly wet myself with fear when we heard about a swimming leg – fortunately only 2 members had to complete this and I was spared by my friends. 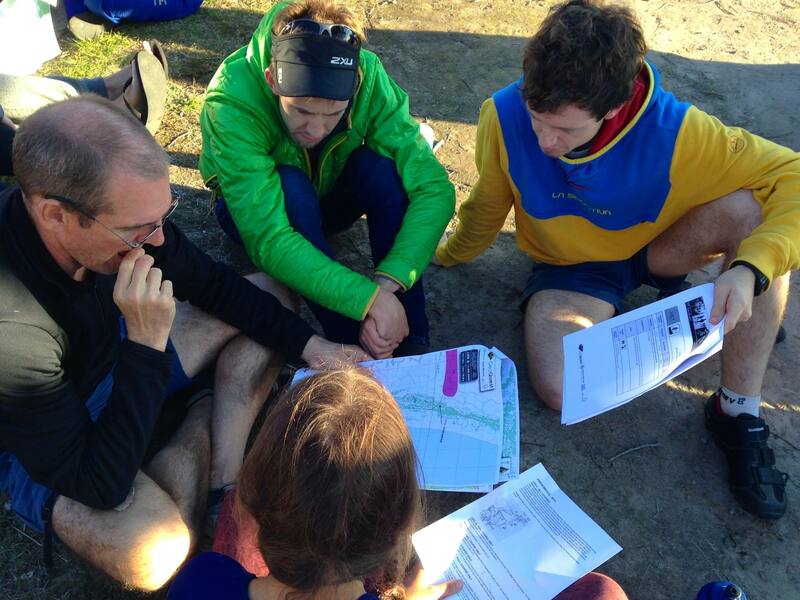 Studying the maps and marking our course went pretty much to plan (with Keith developing a severe stress headache!) 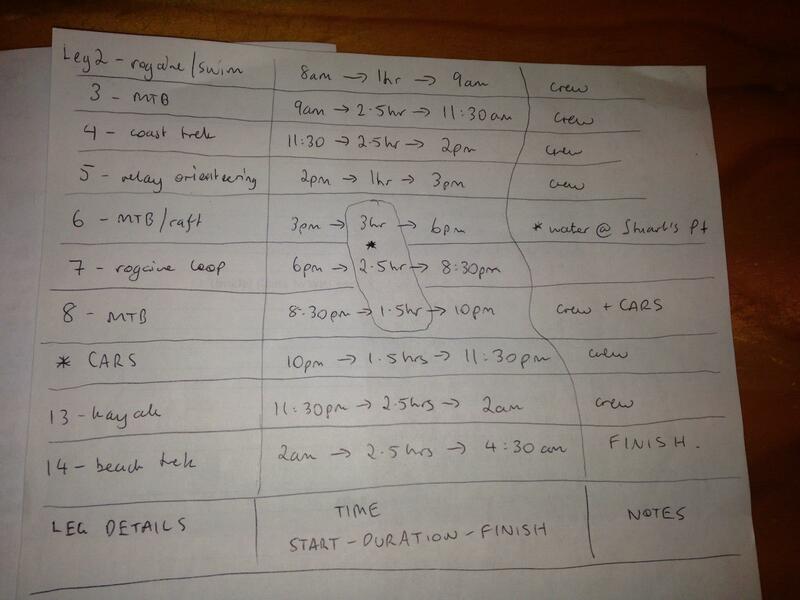 and our rough time estimates predicted that we would be racing to finish by sunrise on Sunday! Em and I helped the team to relax by sharing some of our Tinder conversations with the locals. 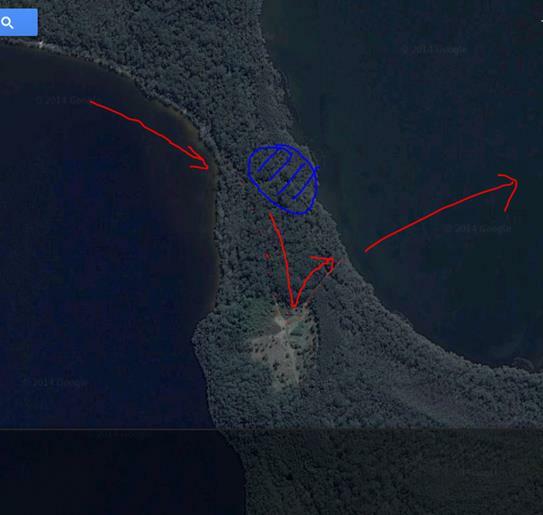 GPS data of our course route. This leg would spread the field out a bit to avoid the certain chaos of an inexperienced MTB peloton! 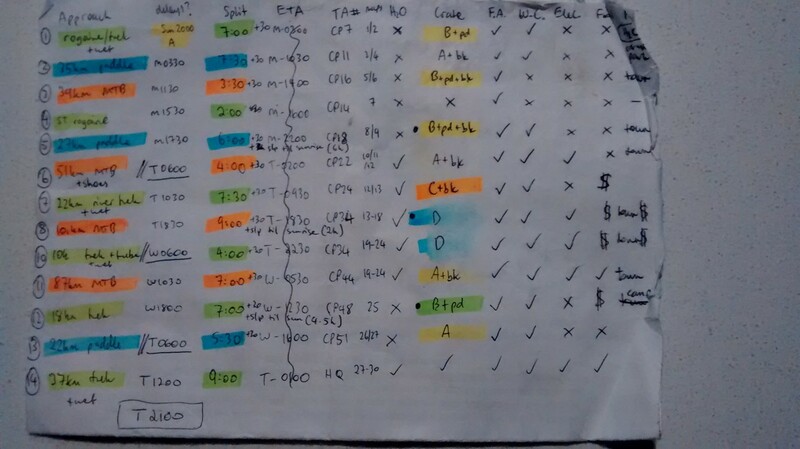 The key strategic decision was to figure out how to maximise time efficiency using two separate pairs of people to complete the swim and collect a few checkpoints – hopefully with both pairs finishing around the same time. Keith and Oli nailed the swim and checkpoint C while Sarah and I grabbed the others in a clockwise loop (plus shortcut across the creek and barefoot run into transition). 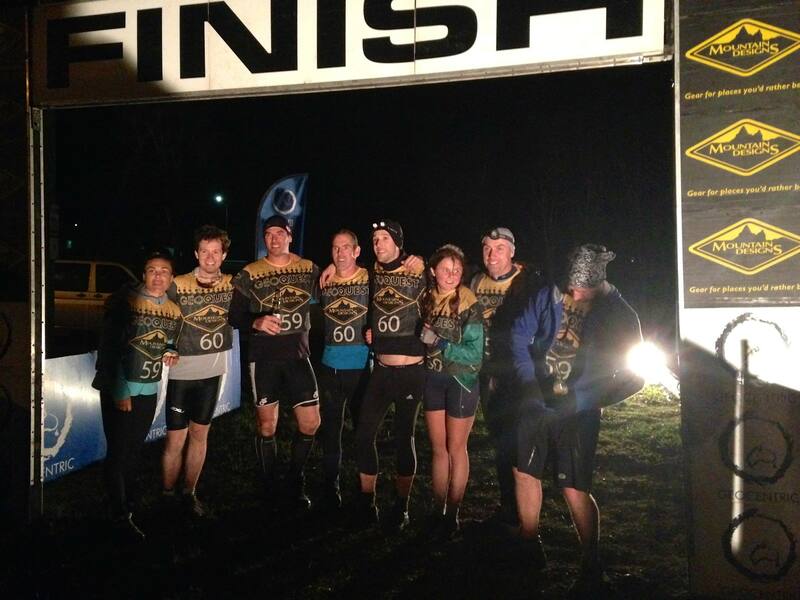 We finished just 3 mins after the lads and were first team to complete this leg, woohoo! 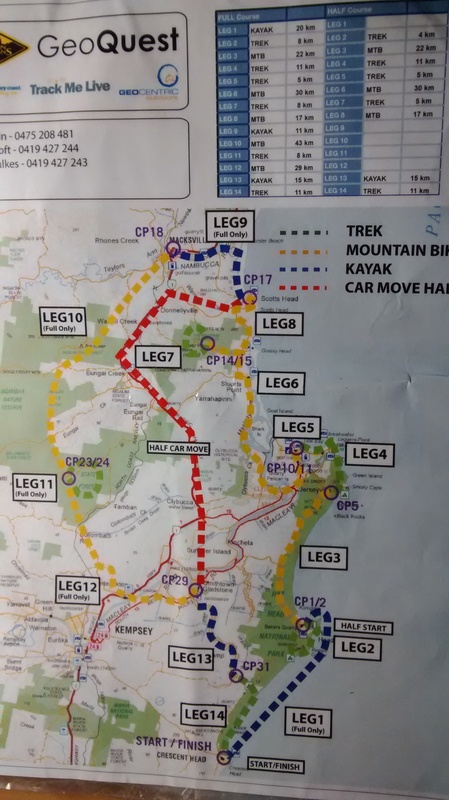 The first MTB leg looked straight forward on the map. 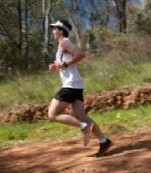 We were in the lead pack of 3 or 4 teams and shared a bit of drafting on the first section of road. Then we hit the sand and chaos ensued. This was not really a skill that many of us had practiced or mastered. We soon figured out that it helped to just relax into the drifting and just keep spinning an easy gear – if you stopped pedaling you would dig in and fall. 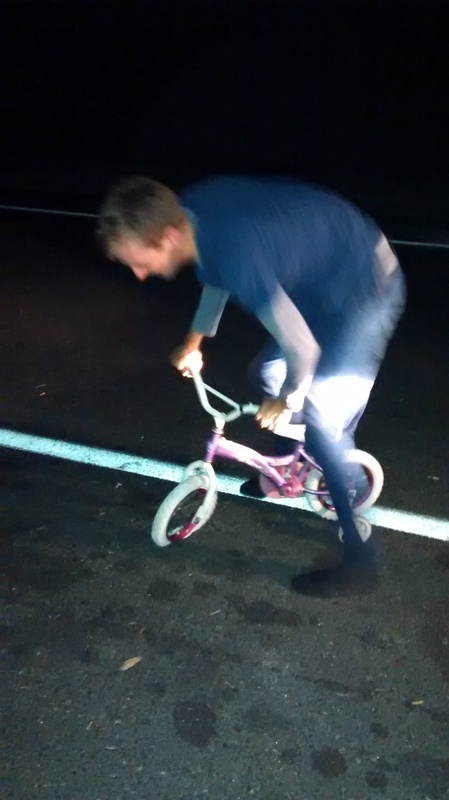 Next we experienced a highly unexpected mechanical problem – Keith’s pedal simply fell out of the crank. Upon inspection, the thread inside the crank had almost rubbed flat, so there was barely anything there to screw the pedal back into. We jammed it in as best we could and limped through to the next transition. 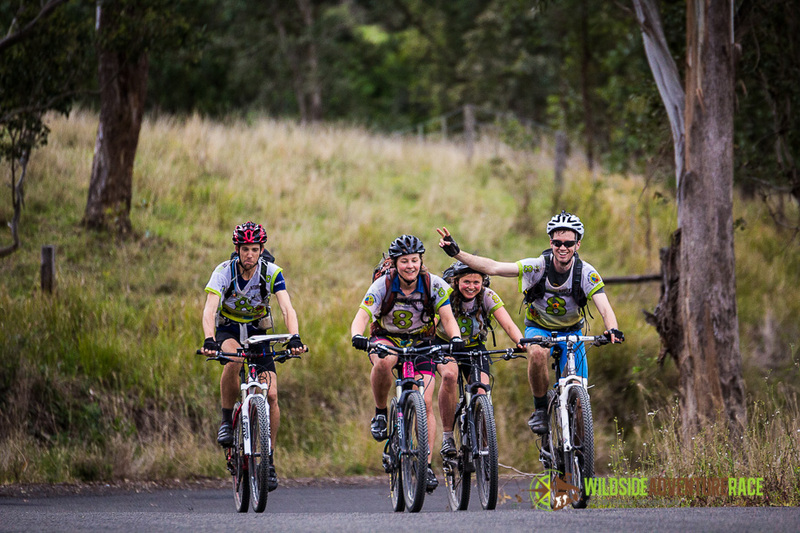 Straightforward team trek with a bit of single track, hill climbing, headland views and a few km along the beach to finish. This was awesome fun. Our whole team can nav confidently, and it was a nice change-up to a more intense tempo. 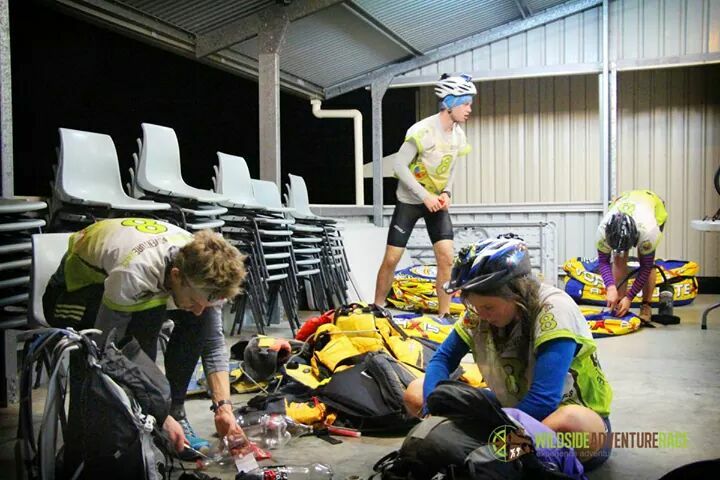 While our teammates did their legs, the wait provided vital preparation time for the next 3 legs without support crew contact – we needed MTBs, head torches/bike lights, running shoes, inflatable pack rafts, paddles, 7hours food/water. This translated to really heavy bags. 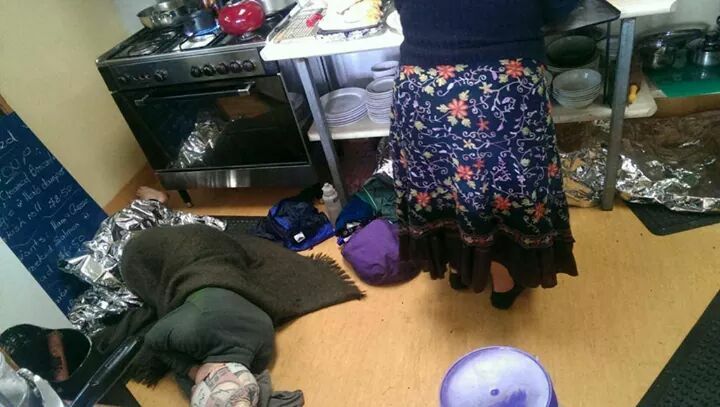 The best laid plans didn’t help us on the pack rafting. 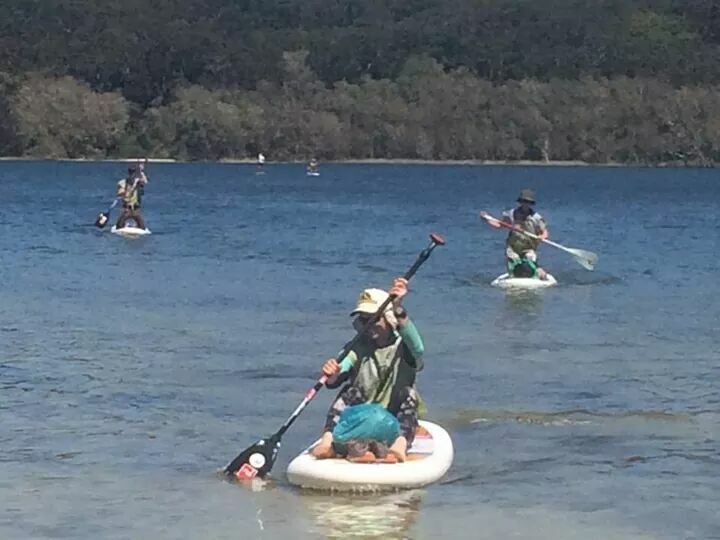 We used a setup based on the photo above, with the front person using their hands to paddle in a backsculling movement while the forward facing person used a modified kayak stroke. Oli and I were concerned about our bike cleats pinching a hole in the raft so had our feet precariously nestled on each other’s inner thighs – gotta trust your teammates! We could hear a slow leak in our boat so we set off quickly, aiming to reach the other side before too much air spilled out. 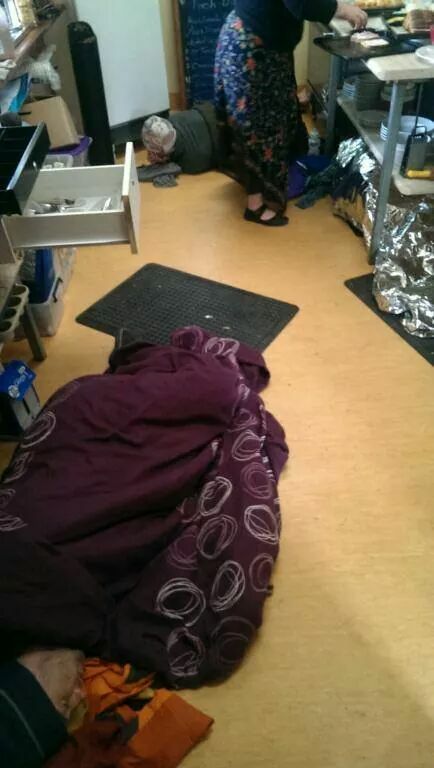 We were hoping this was an internal leak between the two layers of the boat. 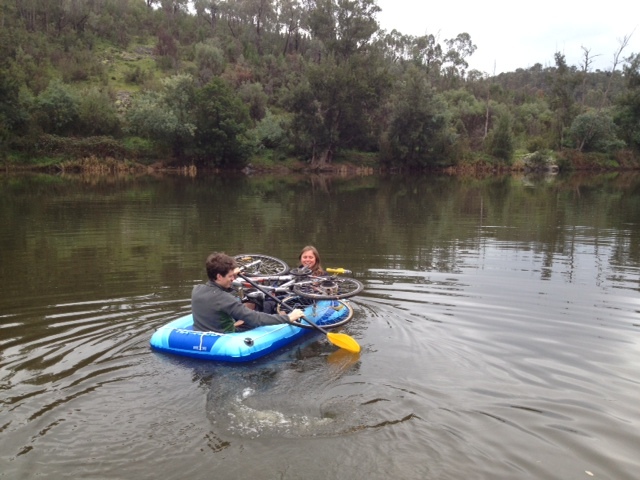 Our paddling setup was too speedy for Keith and Sarah, whose bikes were pretty much falling off their boat, so we had to hang on to an oyster pole and wait for them to avoid violating the 100m team separation rule. We bungee corded my PFD to their boat and grunted it out against the wind/current. 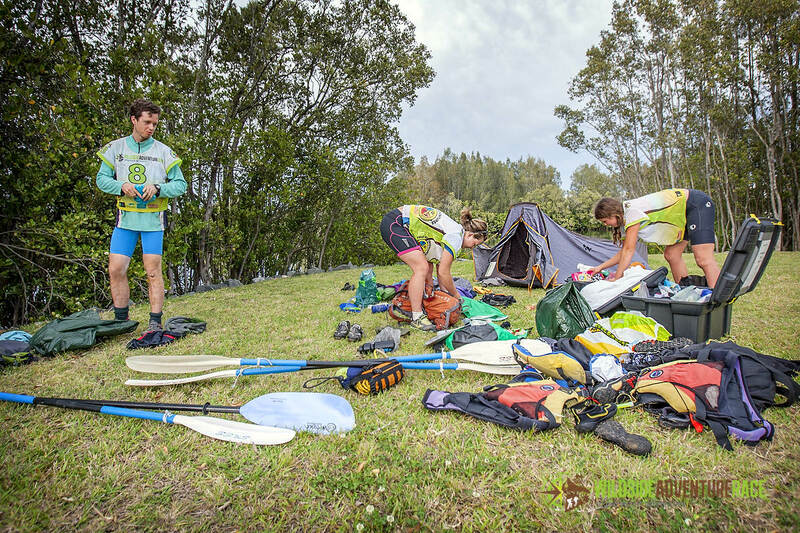 Our paddling position was limited by the bikes and made for an inefficient, shoulder only paddle stroke – slow going and extreme fatigue in such small muscle groups. 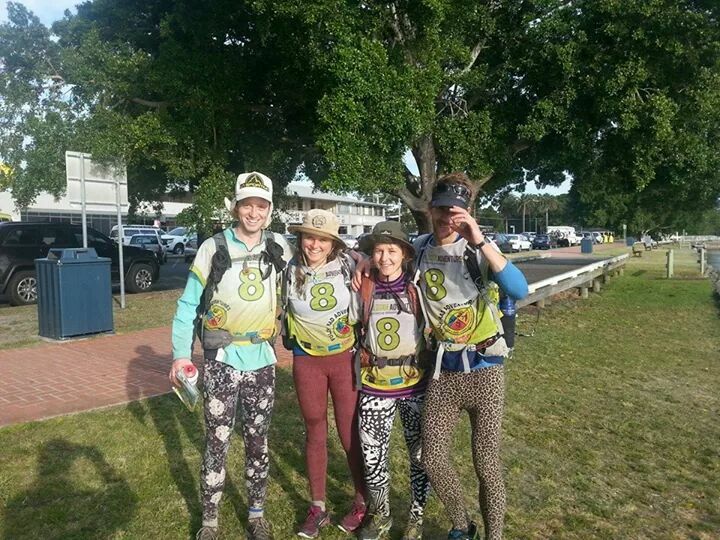 We arrived just before sunset in equal 2nd with Keith’s brother’s team – GuRus! Sarah’s nav made short work of the first two checkpoints with a pack of 7 people in tow behind her, then our two teams diverged to collect different 3rd checkpoints. We bumped into fellow Canberrans Bear Hunt, who were only 2 CPs behind us and mowing their way through the field (as per their race strategy). 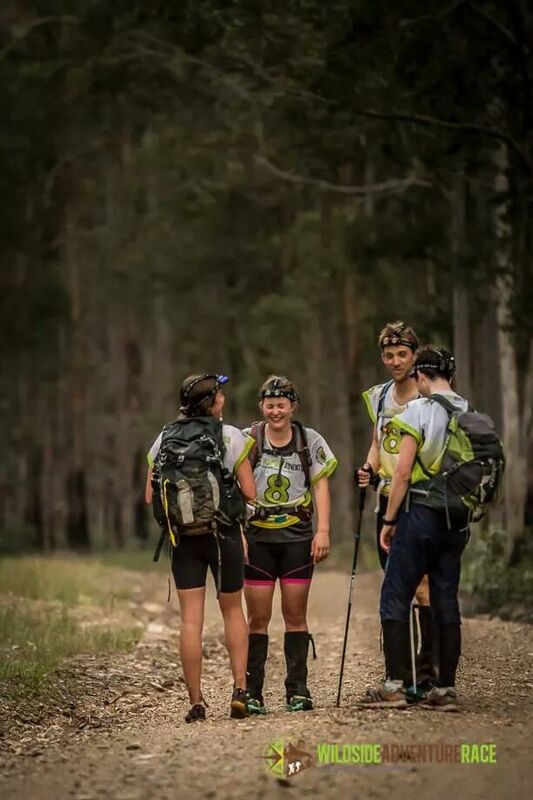 After a dense bush bash for our 3rd CP, we were coincidentally reunited with GuRus on the way into our 4th and final CP – we just couldn’t get away from each other! Our 2.5hr rogaine effort would turn out to be a significant advantage over the majority of teams and we left Way Way picnic area in equal 1st. Oli’s prowess of riding with no hands while re-folding the map and placing it back in the map board saved us some crucial seconds on this leg. 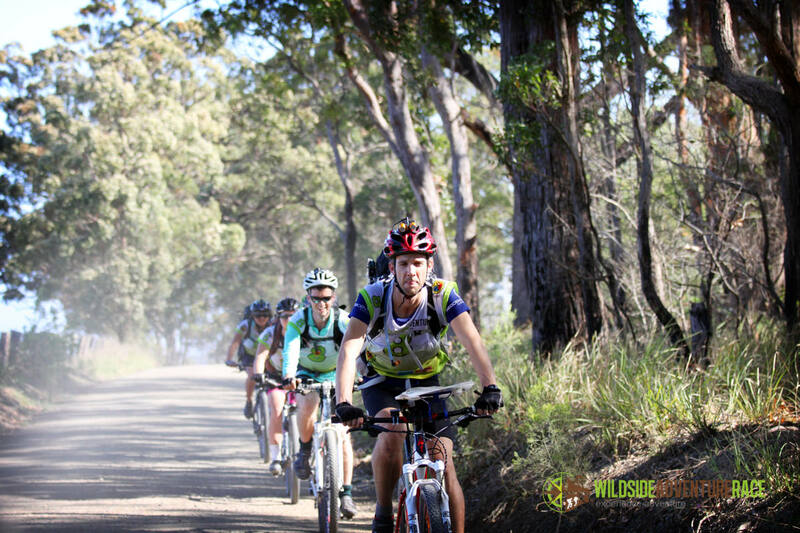 A couple of minor distractions and we were out of the forest and back on the road, getting our pace line on as we headed into Scotts Head. Quick little car shuttle with our awesome support driver Em Cheyne! We were planning to nap in the car but we were ahead of schedule and buzzing so nobody really felt like sleeping. There was panic at the kayak start as we were the first team to arrive and the volunteers were not aware of the location of the paddles that we were supposed to use! A bit of a hunt around and the crisis was averted as we located a trailer containing the stash of paddles. 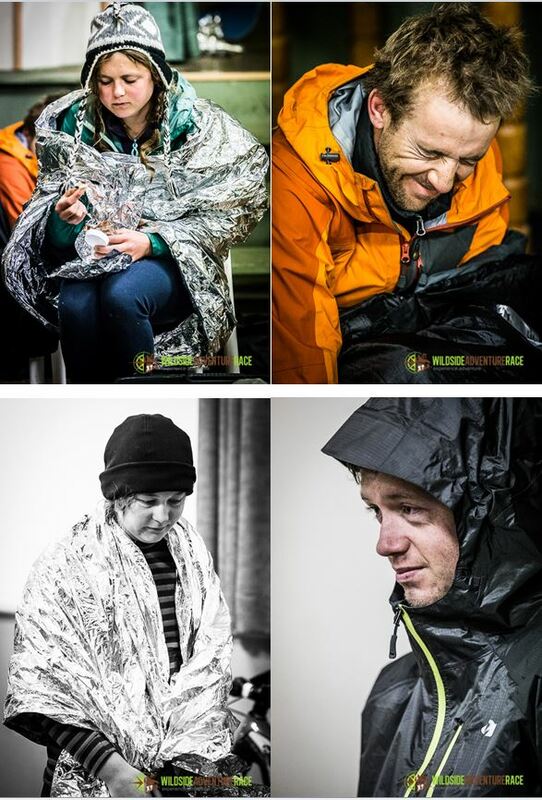 We rugged up for this leg as it was pretty cold. 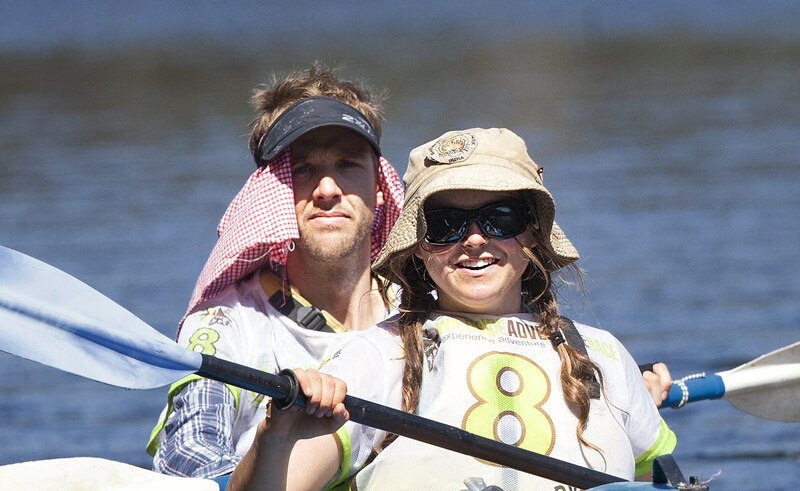 By this point it seemed a safe bet (barring any disasters) that the race for line honours was between us and GuRus, as we reached the halfway portage point together. We pulled away slightly on the second half but ended up together again at the final transition area. A quick change into dry clothes, shot of coffee each and we were on to the final leg. Keith’s ankle had been getting progressively worse all day and at this point any attempt at running 3km on roads sent stabbing pains through his leg. So we walked towards the beach and watched GuRus run ahead. 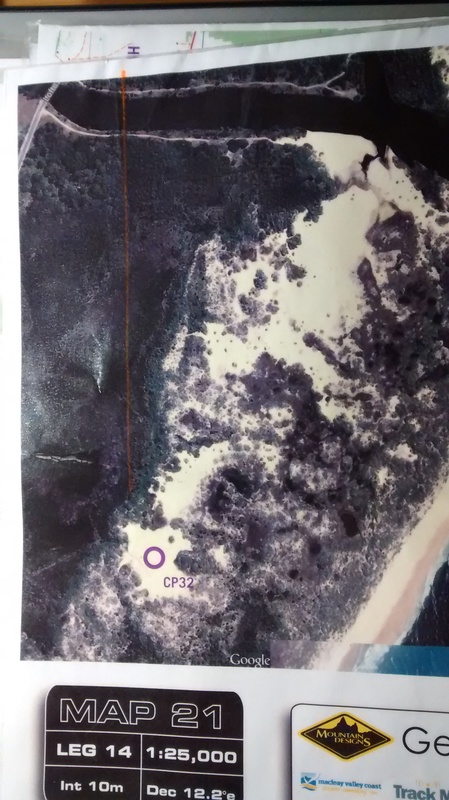 The only CP on this leg was located in a sand bowl (pic above) and we were approaching from the East-West track on the northern edge of the map. 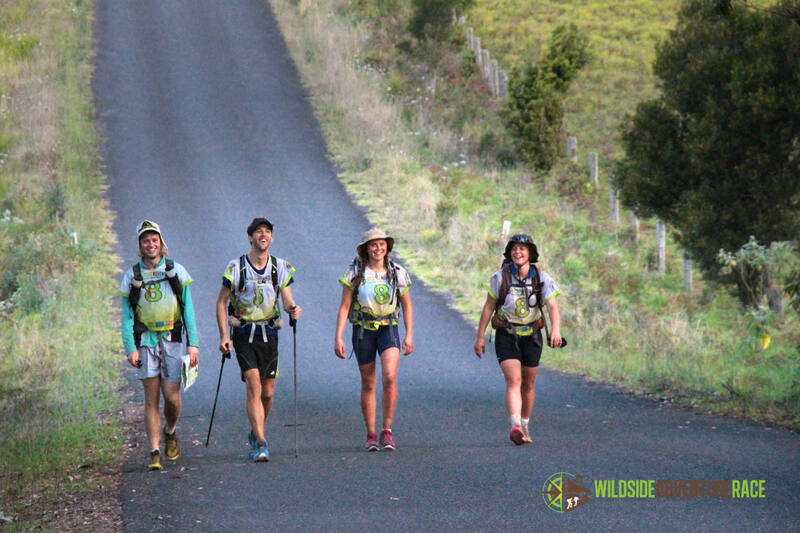 We marched through the dunes and overtook GuRus, leading them into the final checkpoint. Once we crashed through the scrubby dunes, ready for the final 6km beachfront stretch, we had a friendly chat with GuRus and came to a mutual agreement about the finish proceedings. There was a beautiful lightning storm flashing just off the coast as we made our final approach to Hat Head and crossed the line at 2:35am Sunday morning, beating the sunrise by a good few hours! 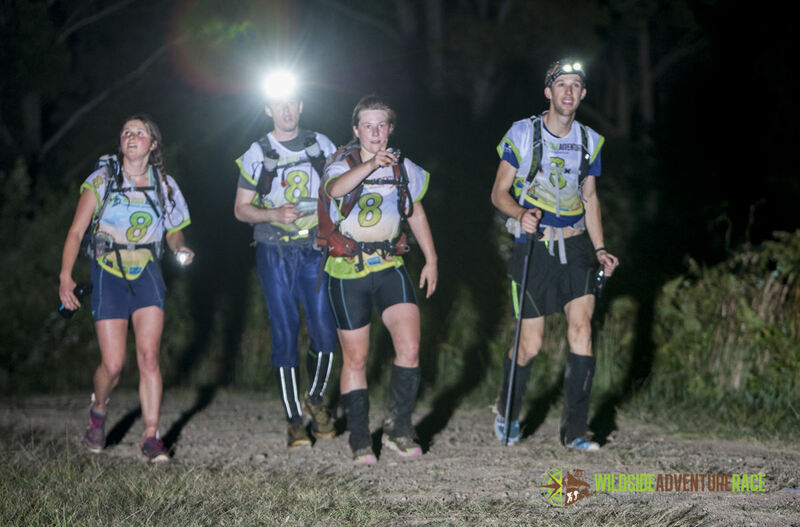 GuRus followed us in 10mins later for 2nd place, and our mates Bear Hunt would also make it in before sunrise for 3rd place in mixed! Gigantic thank you to our support crew (/photographers/chefs/mechanics/medics/physios/drivers/legends) of Em Cheyne and Geoff Conley. We now realise how intensive support crewing is for an AR, I think it’s a safe bet that their job was much tougher than actually running the race! 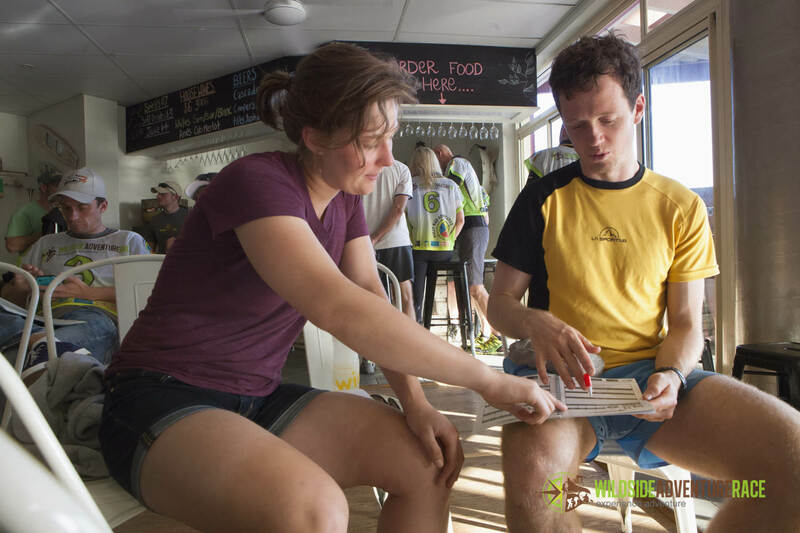 The race HQ was in Crescent Head, which was so amazing that Sarah had to take advantage of the surf on Sunday morning, Oli practiced his bike skills and I did some recovery/exploring. All the AR people were super friendly, and seemed excited to have some fresh/young blood checking out their sport. 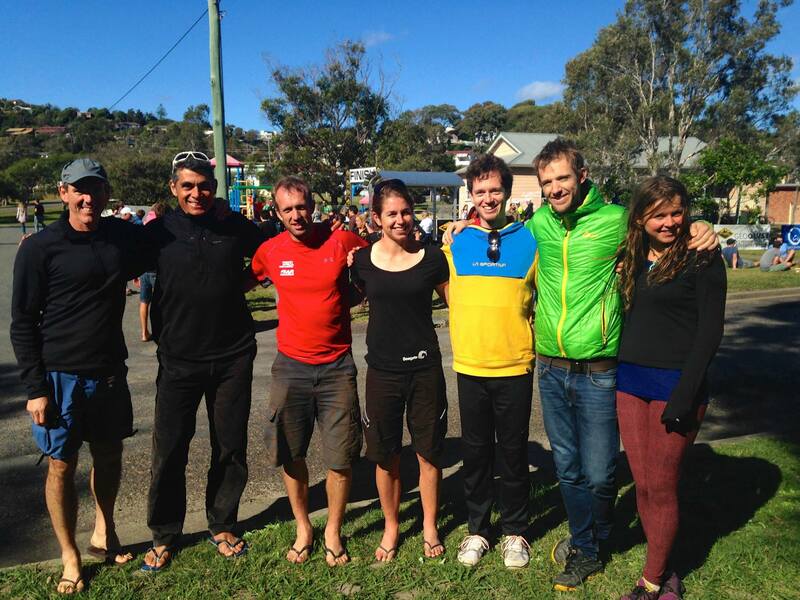 We also got to meet Seagate (world champions) who won the full race during a Sydney pit stop on their way back to NZ after winning Expedition Africa. These guys are freakishly tough but still basically seem like normal people! 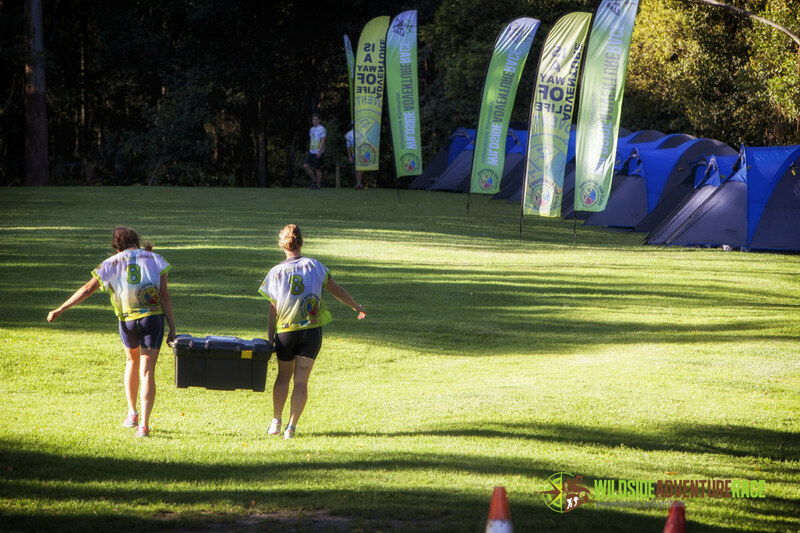 Adventure racing seems to involve complex logistics, heaps of organisation and is fairly expensive, but I’ve got to say I’m hooked. 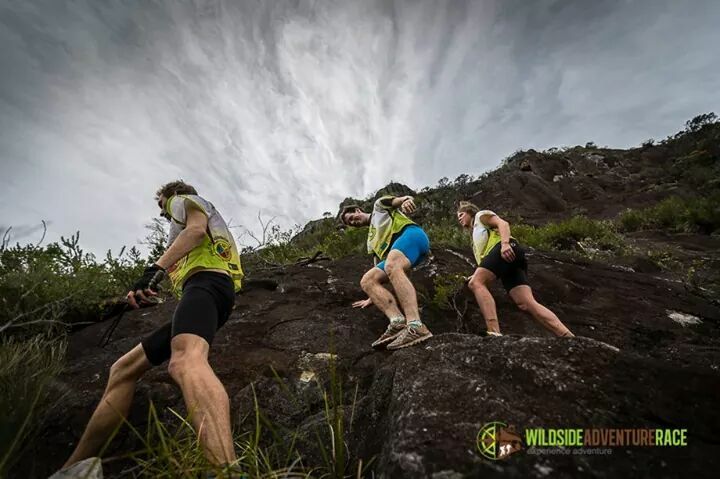 Our team is looking at the Wildside AR (5 day race!) near Newcastle in October. Glow worm next weekend! 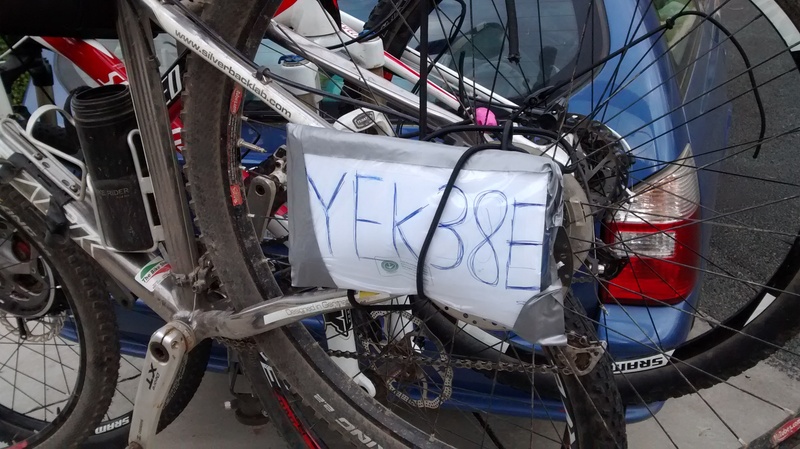 Public service announcement – on the way home during the Monday public holiday, we were smacked with a $400 fine for obscuring our number plate with our bike rack (despite last minute home made attempt for once-off bike rack use). No demerit points but hefty penalty, watch out!